The design and implementation of catch share programs can be confusing and difficult; yet the overall outcome of a well planned and well managed catch share program can yield dramatic results. Catch share programs exist all over the world, some function better than others, but all strive to improve the fisheries in their waters. In this section of the Fish Project the goal is to build an understanding of catch share programs, specifically individual transferable quotas, how they work, and to give examples of programs already in existence. "Catch Share" is a general term for several fishery management strategies that allocate a specific portion of the total allowable fishery catch to individuals, cooperatives, communities, or other entities. Each recipient of a catch share is directly accountable to stop fishing when its exclusive allocation is reached. The term includes specific programs defined in law such as "limited access privilege" (LAP) and "individual fishing quota" (IFQ) programs, and other exclusive allocative measures such as Territorial Use Rights Fisheries (TURFs) that grant an exclusive privilege to fish in a geographically designated fishing ground . Commercial and recreational fisheries result in $162.9 billion in sales impacts in the U.S. economy each year , unfortunately due to a variety of factors such as overfishing, and under regulation, many fisheries are failing, or unsustainable in the long run. By implementing catch share programs which help regulate the fisheries it is possible to rebuild and effectively manage these resources and could significantly increase annual commercial dockside revenues and provide additional access, fishing opportunities, and satisfaction to millions more recreational anglers than at present . Not only have properly managed catch share programs been proven to help ensure sustainable fishing, and increase dockside revenues but it also gives fishermen a sense of stewardship over the catch, instead of trying to race to fish they are trying to maximize the value of the catch. These seven steps can serve as a checklist of sorts in order to help decide the type of catch share program to be implemented, how it will be run, and the ways in which it will be funded to name a few of the important factors that go into designing a program. As you can see from the above table, there are a number of different catch share programs that a community can implement. The type of catch share program that this page will focus on is the Individual Transferable Quota (ITQ). This is defined in the NOAA Catch Share Policy as "an individual fishing quota (IFQ) program where privileges can be transferred subsequent to initial allocations ." When designing and implementing a catch share program it is important to be able to test its key attributes in order to see if the catch share can be successful. In the Environmental Defense Fund's Catch Share Design Manual they outline a mnemonic that can help understand the key attributes of a catch share program. It is called the SEASALT mnemonic. Exclusive: Secure privileges are assigned to an entity (individual or group) and are clearly recognized and defendable by law. All sources: Shares include all sources of fishing mortality (landed and discarded) and when combined do not exceed the catch limit(s). Scaled: Management units are set at the appropriate biological level, taking into consideration social and political systems. Accountable: Participants are required to stay within their allocated share of the overall catch. Limited: Catch limit(s) are set at scientifically-appropriate levels. Transferable: Shareholders can buy, sell and/or lease shares. Although all of these factors are important to a catch share program, not all of them must be put into place for a catch share program to succeed. But the more thorough a catch share program is, the more likely it will be to succeed . The information for the following two case studies was taken from the Environmental Defense Funds Catch Share Design Manual. If you wish to read more on these topics please visit the site at http://www.weebly.com/weebly/main.php#. The Alaskan halibut and sablefish fixed gear individual fishing quota program is a very unique program. It was one of the first to include a number of elements that were designed in order to meet key social goals while also decreasing overcapitalization. Some of its key design elements include restrictions on trading, strict shareholder eligibility requirements and low concentration limits. In the 1880s the Alaskan line fishery began on a very small scale. It grew greatly in the early part of the 1900's, with more and more fishing vessels entering the water until overcapitalization hit a peak in the 1980's. The high number of vessels in the water caused an essential "race to fish". In the very final year before the catch share program was put in place the halibut season was only open for a few days a year, and commercial fishermen were landing their entire catch limit of 43 million pounds of fish in those few days. Although the fishermen had not overfished the stocks, they had consistently exceeded their catch limits. Fishermen began to experience declining product quality, low catch per unit of effort and safety issues such as death at-sea. This overall failure in the fishery prompted managers and fishermen to implement a catch share program. Together, fishermen and managers identified a number of goals that they found important and also followed biological goals outlined in the National Standards of the Magnuson-Stevens Fisher Conservation and Management Act (The principle law governing fisheries in the United States.To read more about the Magnuson-Stevens Act please follow this link http://www.weebly.com/weebly/main.php# ). In 1995, managers implemented an individual fishing quota (IFQ) program for the Alaskan halibut and sablefish fixed gear fishery. the fishery occurs in federal waters off Alaska in the Bering Sea, Aleutian Islands and the Gulf of Alaska. This specific fishery is governed by the National Marine Fishery Service, with consultation by the North Pacific Fishery Management Council and the International Pacific Halibut Commission. Today, fifteen years after the program began, it is meeting its goals. None of the stocks are overfished, and on top of that overfishing is not occurring. Under the IFQ program the fishermen now catch fish over an eight month period. This is quite a stark difference from the fishing season that lasted just a few days. The slower fishing season has had many beneficial consequences, one being that fishermen's dockside revenue has increased substantially. Instead of landing all of the years fish in a few days, after which they over saturated the market with fish, fishermen are delivery higher quality products over a long course of time. Short-term, unstable jobs have been replaced with more stable, long-term, better paying jobs. Also with a slower fishing season, fishermen have been able to innovate. Seabird bycatch used to be a large problem under the "race to fish" era. Now they have developed tools such as streamer lines that have greatly cut down on seabird bycatch. This might not have been possible under past conditions. On a final note, if the fishery had not resorted to a catch share program the fishing season would have continually gotten shorter and potentially could have faced complete closure. The British Columbia Integrated Groundfish Program is one of the most comprehensive in the world. It is multi-species, individually-allocated, species-based, and the shares are transferable. The program includes over 70 species, and includes all commercial fishermen targeting groundfish, regardless of the type of gear that they use. The program requires 100% individual accountability of all catch and uses monitoring and catch accounting systems to support accountability. In the 1970's the stocks off of British Columbia began to notably decline, due mostly to a lack of management in the area up until that point. In response managers began to implement a variety of traditional techniques such as annual catch limits, fishery closures and gear and vessel restrictions. Yet in every year from 1979 to 1990 the catch limits were heavily exceeded, and like in Alaska a race for fish produced shorter and shorter seasons. 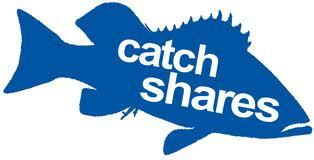 In the 1990's a change occurred with the implementation of catch share programs. Conservation and protection of fish and their habitats was the main goal of Canadian fishery managers. Additional goals included compliance with regulations, fairness to individuals and groups, and economic viability to name a few. Today the catch share program is meeting its goals. Bycatch rates have been reduced, revenues and profits have increased, the catch season has increased, and jobs are more stable. The high level of accountability assures that catch limits are not being exceeded and that stocks are doing well. Obviously there is another side to catch share programs. One of the main arguments against catch share programs revolves around the potential loss of fishing jobs. When catch share programs are created there is a chance that some fishermen will not be allocated shares; resulting in a loss of job and income. Another argument against catch share programs is that it is privatizing a resource (the ocean/fish) that should belong to the "common wealth." Many believe that privatizing these resources is completely unrelated to actually managing the fisheries. This is a topic that many are truly passionate about, one way or the other. When catch share programs are properly designed and managed they have proven to yield benefits in the long run; longer fishing seasons, healthier and more sustainable stocks, and increased dockside revenues. As you can see from the below graph, catch shares over time increase both the number of species present. On the other hand, regulations set up in catch share programs can limit the amount of people who are able to fish; this effect of catch shares can hardly be ignored by fishermen and their families and it is a small wonder that many of them are increasingly upset about the implementation of catch share programs around the world. 1. 2011. Catch share design center | Environmental Defense Fund. Bonzon, K. catch-share-design-manual.pdf (application/pdf Object).in K. Mcllwain, editor. NOAA. 2010. noaa_cs_policy.pdf (application/pdf Object). 2. Bonzon, K. catch-share-design-manual.pdf (application/pdf Object).in K. Mcllwain, editor. NOAA. 2010. noaa_cs_policy.pdf (application/pdf Object). 3. NOAA. 2010. noaa_cs_policy.pdf (application/pdf Object). 4. Office of Sustainable Fisheries. 2011. Catch share design center | Environmental Defense Fund. Bonzon, K. catch-share-design-manual.pdf (application/pdf Object).in K. Mcllwain, editor. NOAA. 2010. noaa_cs_policy.pdf (application/pdf Object).